Then we happened across a YouTube video (Wranglerstar--we love this guy!) 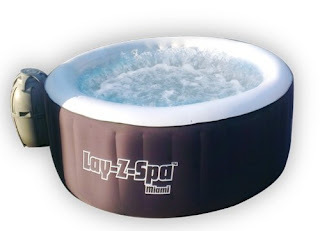 recommending the Laz-Y-Spa inflatable spa. A portable, inflatable hot tub. Really? And it was $257 on Amazon Prime. (Sorry to say the price has gone up. As of yesterday, it's $329.) Not only did it have good reviews on YouTube, it had dozens and dozens of 4 and 5 star reviews on Amazon. So we figured, why not give it a try, and we ordered it last Monday. It arrived on Thursday morning, in a big box left right at our front door. Voila! 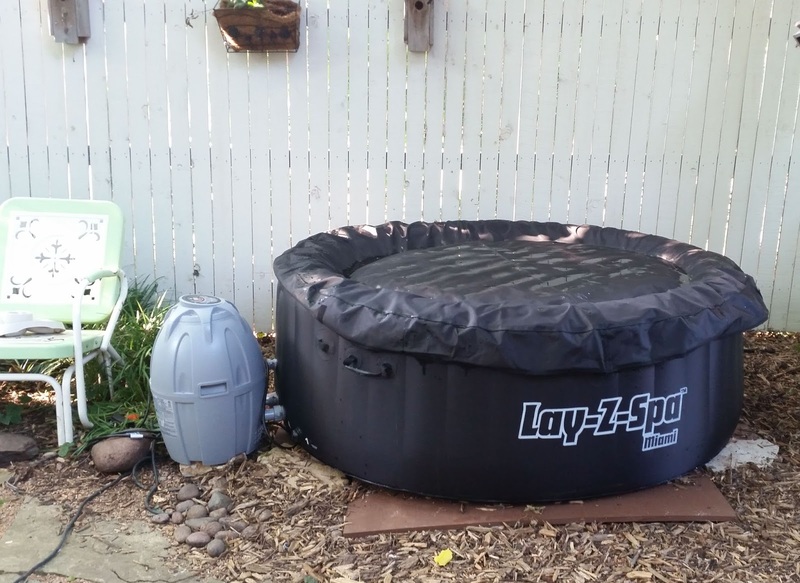 Instant hot tub!!! Well, maybe not quite instant. Here's the skinny, with pictures! First, you have to have a flat and stable surface to put it on, say a weight-bearing deck (not ours!) or a concrete patio. This thing is HEAVY when it's filled. So the only place we could figure to put it was off the street side of our deck, by the fence. But that was rough dirt and bark mulch, and not very level. So we bought a sheet of plywood and Rick painstakingly coated it with waterproof stain. (Sorry, didn't think to get a pic.) It was dry by Thursday morning, so we raked and leveled and settled it into place. 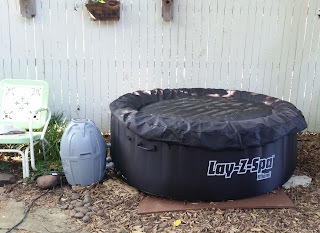 Then on Friday we were ready to unbox the Laz-Y-Spa! There are four parts: the pump, the tub itself, an inflatable insert for the cover, and the cover. 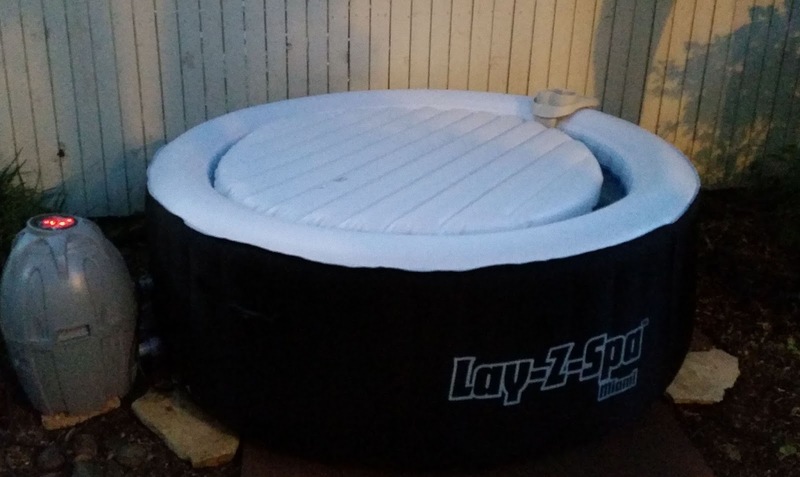 You inflate the tub and the cover insert with the pump. 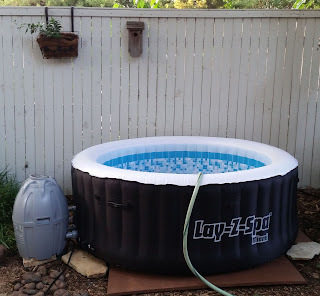 Here's the tub in place on the plywood, filling with the garden hose. And that weird spacecraft looking thingy beside it is the pump. Here's a closeup of the inside of the tub. Aren't the little checks cute? And here's the fancy control panel on the pump, which was telling us that the water out of our hose was 86 degrees. We turned on the heater, set the thermostat to 95, and (not having figured out how to put the insert in the cover) popped the cover insert on the top to help warm things up. A couple of hours later and we were up to 91 degrees. Time to turn on the jets! Wow! We thought all those bubbles in the product photo were photo-shopped in, but it really does that! And here's the tub with the cover on it. It fastens with very easy velcro tabs. We can leave the back half fastened and just lift it up against the fence, but it's easy enough for one person to manage if you want to take it all the way off. Oh. My. Gosh. It is amazing. It doesn't really have jets--it has bubbles that come from a little lip about three quarters of the way around the lower third of the tub. But the bubbles are incredibly forceful and they give you an all-over massage. 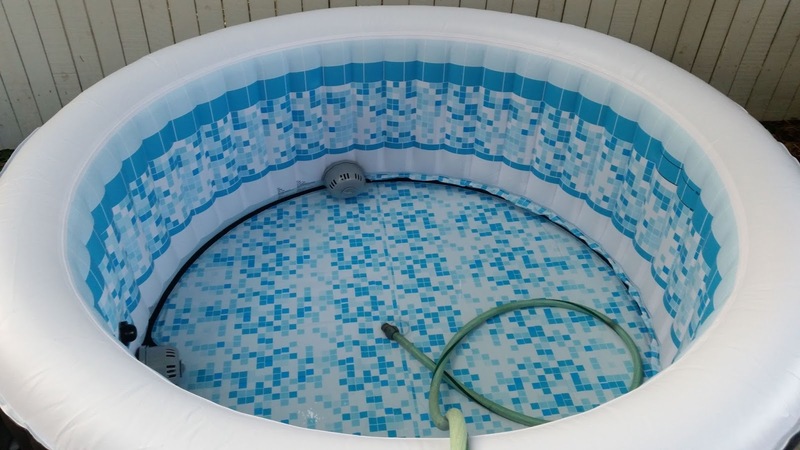 The inflatable tub is SO comfortable, and the controls on the pump are easy to operate. According the reviews, it will heat up to 104, which we are definitely not trying right now. 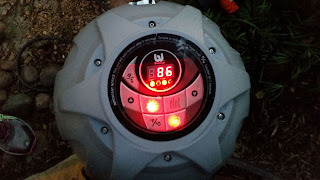 The heat turns off when the pump is on, so I can see that the water might cool fairly quickly if the weather was really cold. But it's really not meant to be a cold-season tub--they recommend you dry it and store it--however some people like it so much they insulate it during the winter. It has two filters, and a floater for the bromide tablets, just like a permanent spa. The tub is advertised as holding four people, but I think they would have to be very cozy people. It's great, however, for one or two. Here I am yesterday afternoon. 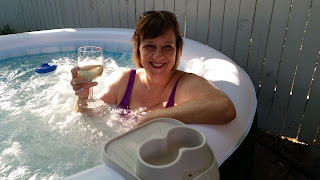 This time that really is wine in the glass, but I'm sorry to say the cool drink holder doesn't come with the tub. You have to buy it separately. My overall conclusion? It's definitely not elegant, although I think if you had a less back-yard-y place to put it, it would look a little snazzier. But you know what? I don't care. The Laz-Y-Spa is fabulous. I will probably be in it every night before bed until I have to tiptoe through the snow, and I think that's probably the best $257 I ever spent. So who's going to try it next? REDS ALERT! Denise Ann is the winner of Marcia Talley's Daughter of Ashes!! Denise Ann, you know the drill. Email me your address (deb@deborahcrombie.com) and Marcia will send you the book! And congratulations. You will love it. Maybe even more than I love the Laz-Y-Spa. The company owes you your money back for the free advertising. :-) Sounds - and looks - like a great purchase. Enjoy it! You look very relaxed and I agree with Marianne that the company should refund your money for the PR you provided. Enjoy it. I want this tub! And we could really use it at our house - Ross is doing a grueling amount of yard work each day as well as installing a slate patio and fire pit; this would be great for his back! And The Boy is working for a moving company this summer - eight to eleven hour days hauling furniture in and out and up and down. Even for an athletic 21-year-old, he comes home with sore muscles. 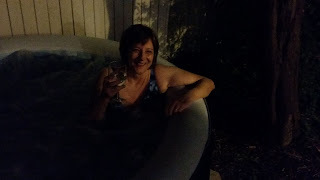 And of course, after a long day of writing, I certainly deserve a place to relax with a glass of wine! Yes, Julia, you should get it!! Ross and The Boy need it, and if people don't think writing is hard on your back, they haven't spent all day doing it. 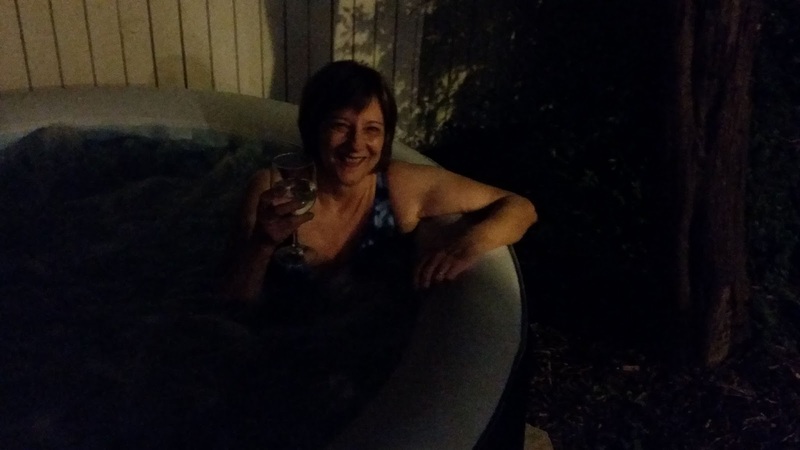 And here's another incentive for you--soaking in the water (baths are great but this is even better) is a great way to get ideas flowing. I do have a couple of caveats I forgot to mention. 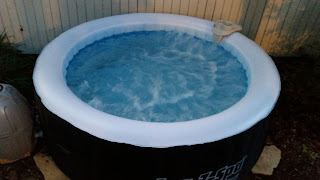 I filled the tub to the Max line, which I discovered, being short, is maybe a little high for me. And this thing is hell on hair. Those bubbles really splash, and there's no way you can keep your hair from getting soaked even sitting up like I was in the pictures. If you have long hair and can put it up you'd probably be okay. I think I'll try a couple of big clips. Or maybe I'll just have pool hair unless I'm going somewhere nice. Oh, one more thing. The tub shuts itself off after 72 hours, so if you don't use it regularly it will get cold and the filtration will stop. I don't think we are going to have a problem with that. Love it! And well-deserved for all my Reds!! I miss my pool, but this could come in a close second! So happy for you, Debs, that your Laz-Y-Spa is just what you needed and wanted. I like the idea of my favorite writers getting their needed relaxation, and even a place for ideas to flow freely along with the bubbles. So, I'm in favor of it being a staple item for all the Reds. Well, Susan, perhaps one of those wonderful massaging chairs would work for you. I don't get a pedicure often, but when I do, the massaging chair is the best part of it. The pictures are great, too, Debs, and I agree with others here that you are due some compensation for being a spokesperson for the product. You've certainly made it sound amazing here. Have other members of the family tried it out yet? I can imagine that it would be a great place to enjoy with your daughter. Oh, and the hair issue. Could you get one of those terry turbans and wrap your hair in it? So excited about the book!! And, that spa looks like heaven. After that endorsement the Amazon price will probably double! LOL. Marcia, it occurred to me that the price went up after Cody on Wranglestar did his video. But he has a lot bigger following than me! Looks fabulous. I swore years ago I'd never have a pool (worked in a pool store in college and heard all the horror stories), but I'd have a hot tub and this looks perfect.